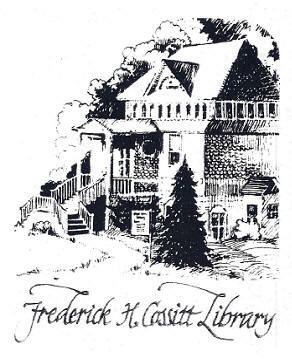 Frederick H. Cossitt was one of our many Cossitt ancestors who were philanthropists. He is, perhaps, best known for establishing libraries in Granby, Connecticut and Memphis, Tennessee. On December 18, 1811, Frederick Henry Cossitt was born in Granby, Connecticut. He was the great-great grandson of Rene and Ruth Cossitt who had settled in this area a century earlier. For the most part, he remained in Granby until 1826 when his father died. At the request of his uncle, George Germain Cossitt, he bid Granby a final farewell and moved Tennessee. After being engaged in business ventures in several southern states, he moved to Memphis in 1842 where he carried on a successful wholesale dry goods business. In 1859 he made his final move which was to New York City. His business ventures in New York City involved real estate, insurance, and banking. In 1846 he married Catherine Andrus of Hartford and they had three daughters and one son. The eldest daughter, Helen married Augustus D. Juilliard of New York City. They had no children and upon their deaths, (Helen 1916, Augustus 1919) they left over 12 million dollars to create the Juilliard Musical Foundation. 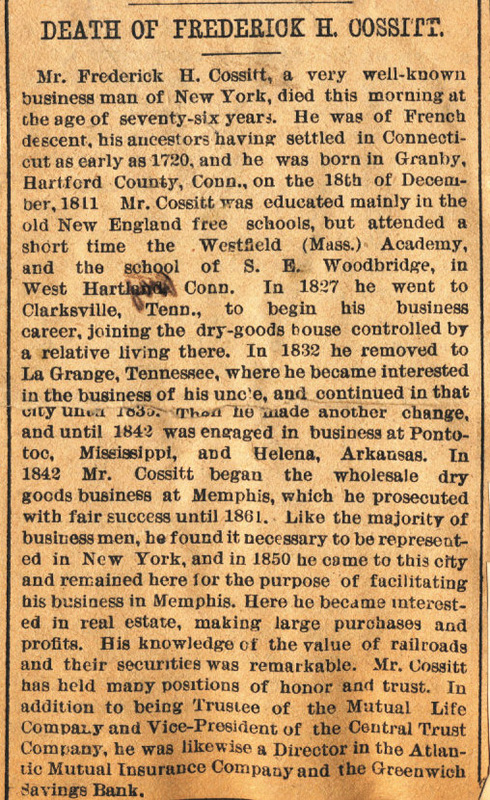 Prior to Frederick H. Cossitt’s death on September 23, 1887, he had orally expressed a desire to build a library in his birth town of Granby as well as Memphis, Tennessee. Although this desire was never reduced to writing, his heirs honored his desire and gave $10,000 to the town of Granby and $75,000 to start a library in Memphis. The library in Granby, Connecticut was opened in 1891 in a new building with 1300 books on the shelves. It was located across the street from the house where Frederick H. Cossitt was born 80 years earlier and on property that was once owned by Rene Cossitt. This library still operates today in the same location as a branch of the Hartford County Library system. It is located at 388 North Granby Road in North Granby, CT and the phone number is (860) 653-8958. The town of North Granby is about 10 miles due west of the Hartford Airport. The library is located several miles north of the town and is on the east side of the road. You can’t miss the red two story building that looks something like an old school house. If you visit the library, be sure and request permission to sign “The Cossitt Register”. 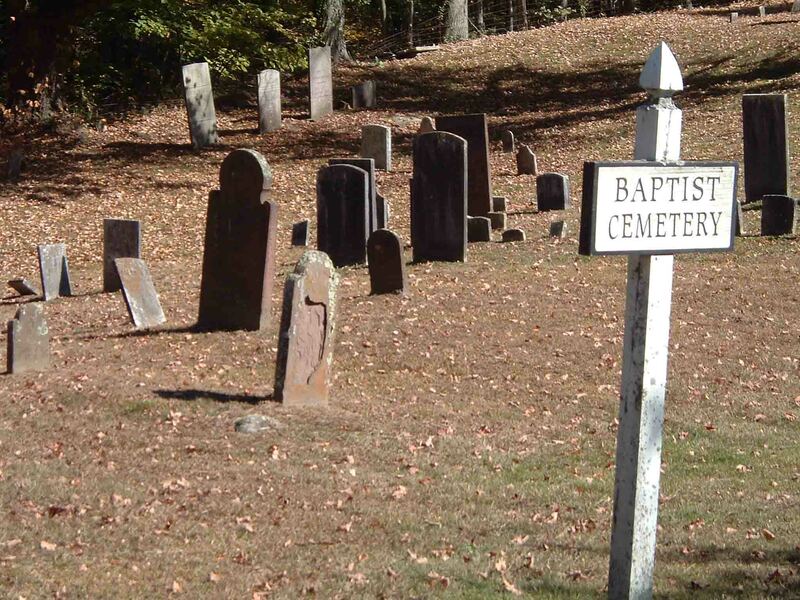 On your way to the library from the town, look for an old cemetery on the same side of the street with a sign that says “Baptist Cemetery”. This is where Rene and Ruth are buried. Copyright © 2008 Cossitt Family Association Inc. All Rights Reserved.